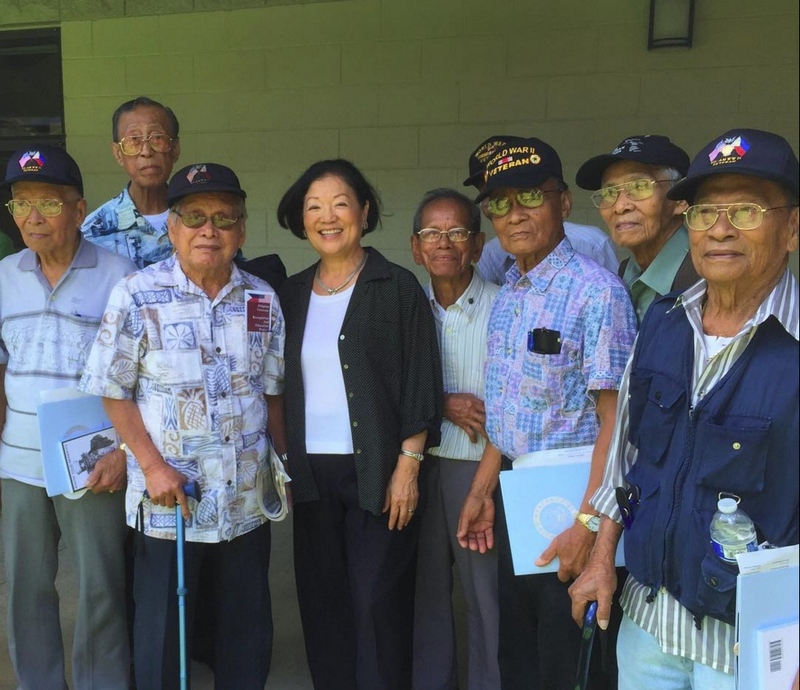 Sen. Mazie Hirono met with Filipino veterans in Hawaii in August 2015. WASHINGTON — The U.S. Senate on July 13 passed a bill authored by Sen. Mazie Hirono to award Filipino veterans who fought for the United States the Congressional Gold Medal, the highest civilian award that Congress can bestow. A broad, bipartisan coalition of 71 senators co-sponsored the legislation, which recognizes Filipino soldiers who fought alongside Americans during World War II. “Filipino World War II veterans served their country with distinct honor and uncommon valor and we owe them a profound debt of gratitude,” said Maj. Gen. (retired) Antonio Taguba, chair of the Filipino Veterans Recognition and Education Project. “I am proud that with the Senate’s unanimous passage of the Filipino World War II Congressional Gold Medal Act, the veterans are significantly closer on their lifelong goal of national recognition of sacrifice and selfless service during World War II from the U.S. Congress. S.1555, the Filipino Veterans of World War II Congressional Gold Medal Act of 2015, recognizes over 260,000 Filipino and Filipino American soldiers who responded to President Franklin Roosevelt’s call-to-duty and fought under the American flag. Last August, Hirono held an informational briefing in Hawaii for the veterans and their families to learn more about this bill. Hirono has also successfully led the fight to reunite these veterans, who were granted U.S. citizenship in the 1990s in recognition of their service, with their children who were not, and successfully prevented the Department of Veterans Affairs from taking funds from the Filipino Veterans Equity Compensation Fund to pay for other projects. S. 1555 must now be passed by the U.S. House of Representatives in order to be sent to President Obama for his signature.